I have always liked German tanks in red primer. That‘s the red color utilized to prime the German tanks before the dunkelgelb and camouflage colors. Some time ago I painted a “paperpanzer”, a Maus, where I tried to paint some panels in red primer. However, I didn’t like the result because the red color seemed too rose. Also, the panels I painted didn’t have too much logic. 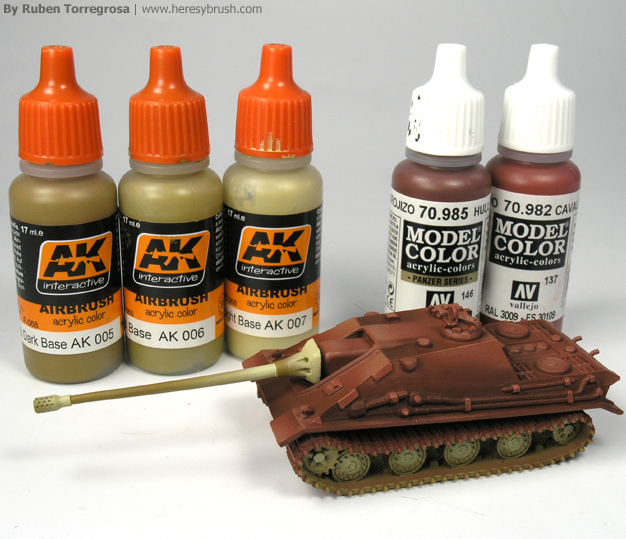 Nevertheless, I’ve seen an E-50 tank painted in red primer by Adam Wilder recently; and I felt the necessity to paint a whole tank in this color. So, I took advantage of an E-75 Jagpdanzer from Heer46, and I’ve tried to paint a tank fully in red primer. First and foremost, I’ve learnt from some past errors: this time I’ve changed the colors palette. Thanks to Rinaldi’s book Tank Art vol. 1 (I recommend this book besides Tank Art vol. 2), I decided to used the color Cavalry brown 982 (Vallejo) like standard red primer color. Because I like to use the modulation technique, I needed a darker color to apply shadows. So, I chose Hull red 985 (Vallejo). Finally, lights could be applied by mixing Cavalry Brown 982 with a light sand color, like Dunkelgelb base AK 006 (AK-Interactive). I decided to use AK 008 because this color has a yellow base, so it’s suppose I could avoid too rose lights. As I told, I decided to paint some elements in dunkelgelb to get more contrast in the vehicle: wheels, gun and some little accessories. Thus, I’ve used the following triad: AK 005, AK 006 and AK 008, from the dunkelgelb modulation set from AK-Interactive.